Home » Blog » Everest Base camp trekking route. Where Everest Base camp trekking route located? There are many of visitors wish to trek into the Everest base camp trekking route and confuse about the location from where and how we can start to trek into Everest Base camp trekking route? Either it is Nepal or in Tibet? About Everest Base camp trekking route. The complete Everest Base camp trekking route distance is in about 130 KM / 81 miles more or less. Which is fly to Lukla and fly back to Kathmandu from Lukla. This 130 KM trekking route can take thirteen to fourteen days to trek more or less However, many trekkers also start the Everest base camp trek via Jiri / Shivalaya by bus which takes more day as well as more distance. 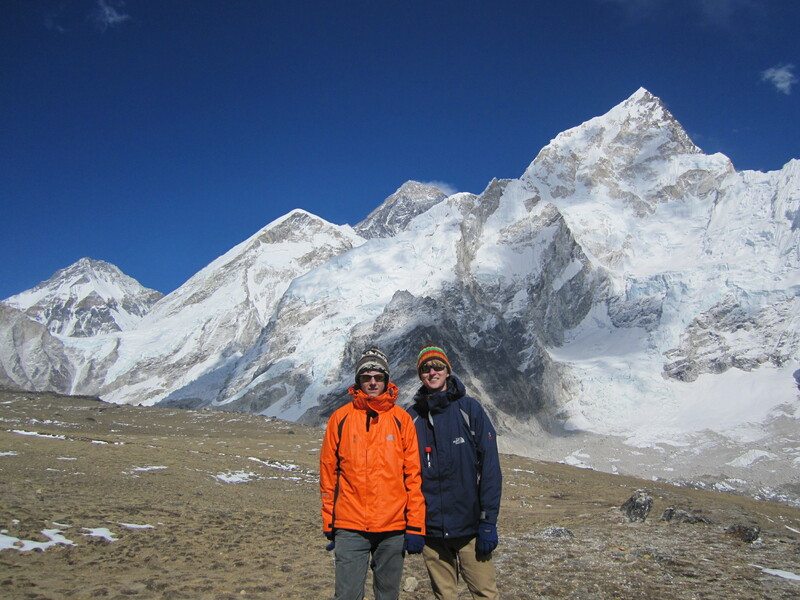 Everest base camp trekking route is one of the most famous trekking route in the world. Probably more than two hundred thousand trekkers trek this route mostly Autumn and Spring however there are also many trekkers trek Everest Base camp trekking route during the winter and summer. What Everest Base camp trekking route offer? This route is one of the most popular trekking routes of Nepal Himalaya, commanding the exciting views of Lothse ( 8516 MTRS ) and Nuptse ( 7855 MRS ) not to mention that Mount Everest 8848 Mtrs the world hights peak called Mt Everest which is also called as Sagarmatha in Nepali and Mount Chomolangma in Tibet., The Everest Base camp Trekking route starting from Lukla this course goes through Namche Bazar ( Market ) and visit the Gompa , Monastery in Tyangobche. 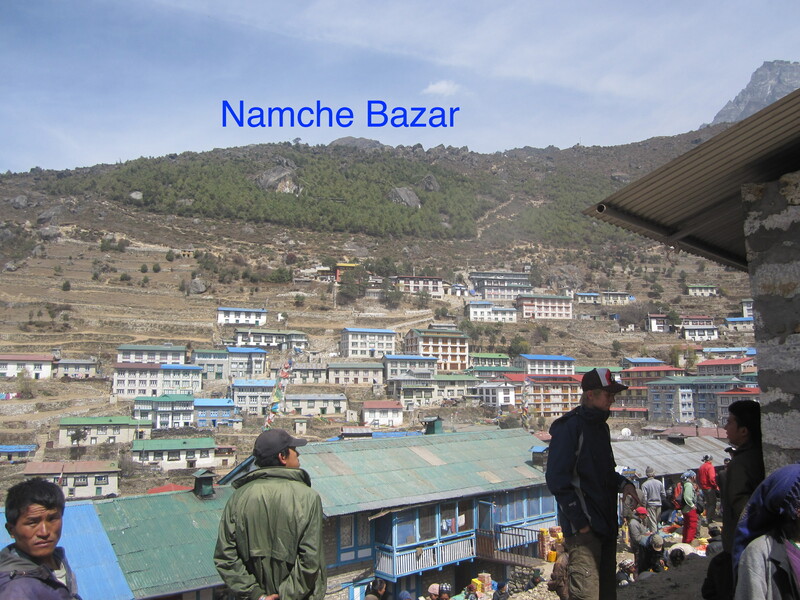 Namche Bazar know for its open air bazar and as the home town of the Sherpa people. The gompa is in Tyngaboche monastery is a head monastery of Tibetan Budhisim. There is another monastery in Pangboche which Is as town further interior , and all will observe the religious life of the mountain people. 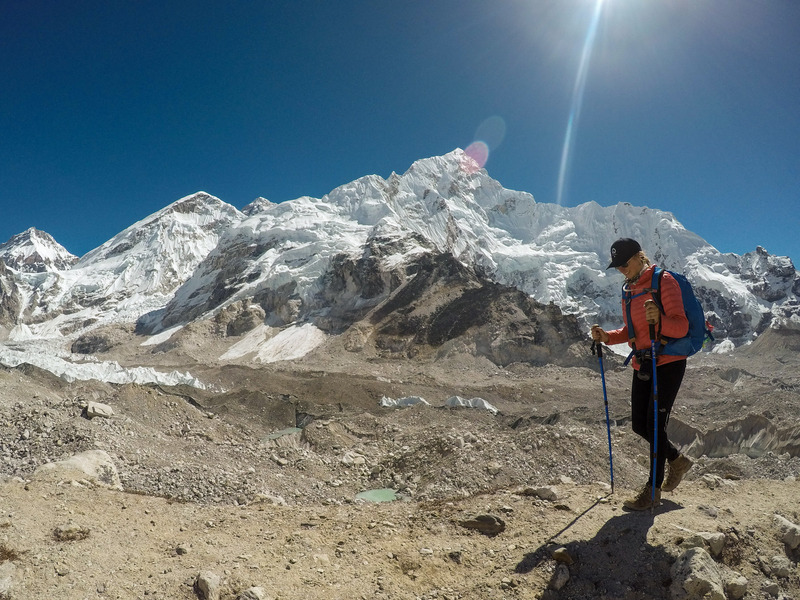 From Lubuche on, trekkers will be trekking in the glacier area and after visiting the belvedere in Kalapatthar ( 5555 MTRS ) you will finally reach Mount Everest Base camp ( 5350 MTRS ) in the remotest point of the Khumbu glassier. Trekkers always have beautiful scenery, gorgeous mountain from each and every corner, an Amazing culture of Sherpa people. past colorful prayer wheels and across swing bridges straight, mix of natural beauty, attractive culture and a personal sense of accomplishment, as well as warm Nepalese hospitality from the people of the Khumbu region all makes the Everest Base Camp trek one of the world’s most memorable trekking route in the world. How I can trek into Everest Base camp trekking route? –It is suggested to the trekkers registered wit the government registered trekking company of Nepal. -Take at least a license holder guide or a porter. -Make sure that you do have normal medicines for the normal treatment. -Trekkers should read and have an idea about the altitude sickness. -Must have to have permit and all needed documents. -It is also suggested to the trekkers to have a travel insurance before trek into the Everest base camp trekking route. -Pease take warm clothes as well as good trekking boots, make sure that you do have warm sleeping bags and down Jackets – 20 DC. More or less. -Stay helthy and safe during the trek. Map of Everest Base camp trekking route. Food, water, Accommodations in Everest Base camp trekking route. Food and drink are available easily on Everest Base camp trekking route. Tea houses for the accommodation is also available during the trek on Every camp side, however in Lobuche and Gorekshep, there are not so much choices of the Lodge and tea houses due to it is remote place, The price of foods and drink are also go up whenever you trek up due to its transportation, it is all carried by porter , Man, there are no road transportation and access of road. In place like Namch, Lukla, Tyngboche, and few other camp sides the luxurious hotel are also available which comes with attached bath and hot shower with heating facilitates, Basic and normal tea houses lodge are available in every camp side as well, It is suggested to the trekkers to carry the water purification tablets for the drinking water or UV filter or Boiling water can be also available to buy. Most tea houses has a set breakfast on their food menu which comes with two toast, eggs, potatoes, and tea or coffee. It is also suggested that not to take any meet items during the higher side of the trek because it all carries from Lukla and most of the time it is old. Permit, National park fees. TIMS local taxes for The Everest Base camp trekking route. Entrance of Sagarmatha National Park can be arranged from the government authorized trekking company in Nepal. The cost for Sagrmatha national park fee is 3000 NRS +13 % tax which is more or less, 34 USD per person, TIMS card is also needed for the trekkers which is 2000 rupees (about $20 USD) for a Free Individual Trekkers (FIT) card and 1000 rupees (about $10 USD) for a Group Trekkers those who hire a guide or porter but since ( October 01 , 2017 ) local tax 2000 NRS ( 20 USD ) has been applicable for all trekkers and TIMS card is not strictly checked and many trekkers and company avoid to purchase a TIMS card in Everest Base acmp trekking route. Best time to trek into the Everest Base camp trekking route. Trekkers can trek in Nepal at any time of the year. However, each season in Nepal distribute a different observing landscape, the most popular times with optimal trekking experiences are divided into two best season. The first best season of the year is between late February – March – April (Spring) , The second peak season of the year is between late September – October – November (Autumn) The other seasons in Nepal include » November – December – January – February (Winter) » May – June (Summer) June – July – August – early September (Monsoon). From March to May and from September to December. It gets hot in May, just before the monsoon season; be prepared for possible rain. December reaches below-zero temperatures but the days are still beautiful and there are fewer trekkers. Everest Base camp trekking route itinerary. 03 Rest Day in Namche Bazaar. 04 Trek from Namche Bazaar to Tengboche (3850m). 06 Trek from Dingboche to Lobuche (4950m). 07 Trek from Lobuche to Ghorakshep (5160m). Trek to Everest Base camp 5,380 m (17,600 ft) and down to Ghorakshep. 12 Fly from Lukla to Kathmandu. However, there are many other alternative routes are available. -Such as https://www.excitingnepal.com/trip/everest-base-camp-gokyo-cho-la-pass-trek/ Everst base camp Gokyo cho-la pass. – https://www.excitingnepal.com/trip/everest-base-camp-trek-via-jiri/ Everest Basde camp via Jiri. – https://www.excitingnepal.com/trip/everest-three-pass-trekking/ Everest base camp three pass trek. Conclusion of Everest Base camp trekking route. The Everest base camp trekking normally start from Lukla, altitude of 2860 MTRS and go up to Kalapatthar 5555 MTRS, which is the best view point of the Mount Everest. The Mount Everest Base camp is more or less 5350 MTRS in altitude however it is just Base camp of Mount Everest and can not view the peak of Mount Everest from its base camp. Namche Bazar is also an another attraction of the Everest Base camp trekking route. Climbing The Kalapatthar is one of the lifetime achievement which is a rare view point of the world. We hope that this post , information of the Everest Base camp trekking route will help those who are planning to trek Everest Base camp trekking route. Please fill free to contact is if there will be any question or confusion.